In a blog post last year, I questioned whether the meat of the polar bear was especially edible. Well, travel is educational and I got some kind of an answer on my recent visit to the Westfjords of Iceland. The very splendid Westfjords Heritage Museum in Ísafjörður had a small display about the shooting of a polar bear up at Hornvík in the far northwest of the region in June 1963 by some egg-hunters from Ísafjörður. It made the front page of the national newspaper and what struck me was the description of how the bear was eaten. According to the article, they cooked the meat and found it delicious, not unlike beef. They also ate the heart and gave the liver to guests. They managed to bring back 250 kg of meat which they sold at 30 kr./kg., along with the 3000 guillemot eggs they had collected during their week-long trip. So there you have it. Not sure I'd fancy polar bear myself, but apparently it is perfectly edible. My recent visit to the Westfjords, and to Hrafnseyri in particular, sent me back to re-read Hrafns saga Sveinbjarnarsonar. A relatively little-discussed saga, it is set in the Sturlung era, and recounts the life history of Hrafn up to his execution by his rival Þorvaldr in 1213. Much of the saga is taken up with feuds of various kinds, over sheep or whales, or the more serious political rivalries which characterised the Sturlung period. But there is much of general interest in the saga, not least the fact that Hrafn was a famous medical practitioner. He inherited this skill from his great-grandfather Atli who acquired it at the battle of Hlýrskógsheiðr when St Óláfr appeared in a vision to his son Magnús the Good and told him to select twelve of the best men to bind the wounds of the warriors. That slight touch of sanctity accompanied Hrafn throughout his life and in his martyr-like death. In general the saga has a vast cast of characters, including quite a few women, lots of poetry, and the hero has some interesting adventures abroad. But most of all it has a lot of detail about life in the Westfjords at the time. Here I just look at a few anecdotes which particularly caught my eye after being in the place. The saga-author was particularly partisan as regards his hero, and spends considerable time outlining his virtues. Hrafn lived at Eyrr (now Hrafnseyri) for most of his life and was apparently a very benevolent local leader. He was a generous host who fed everyone who visited, he ferried people across the Arnarfjörður for free, and also kept a ship on Barðaströnd for the use of people who needed to cross the Breiðafjörður. Certainly, a ferry across Arnarfjörður would have been a lot quicker than the long road around every fjord that is so typical of the Westfjords today. Hrafn also took no fees for his medical interventions. As the pious author remarks, 'For that reason, we expect that Christ will have provided Hrafn with spiritual healing with him for free on his death-day'. Early on in his career, Hrafn was able to help out when a walrus beached in the Dýrafjörður during the spring assembly. The animal proved difficult to capture, so Hrafn called on St Thomas of Canterbury for help and promised to give him the tusks, still attached to the skull, in return. The walrus was duly caught and the following year Hrafn went to England where he donated the tusks, as well as some money, to the minster in Canterbury. The walrus skull and tusk (of unknown antiquity) pictured here was in the splendid local museum at Hnjótur. There is archaeological evidence for walrus hunting in the first century of Norse settlement in Iceland, but this seems to have died out and the export of walrus ivory became a mainstay of the economy in Greenland. More recent captures of walrus in Iceland will be of stray walruses (who do however seem to be arriving in greater numbers in recent years). The course of true love did not run smoothly in the Westfjords, according to the saga's account of the tribulations of a woman called Jórunn. Her father was Snorri, a great chieftain in Ísafjörður, who had many children, none of whom were legitimate. A half-brother of Jórunn's was Hrafn's great rival Þorvaldr, and her love life undoubtedly contributed to the start of their feud. Jórunn's first admirer was a certain Sveinn, who just happened to be her brother-in-law. Sveinn was a follower of her brother Þorvaldr, but it was her other brother Þórðr who organised an attack on Sveinn, in which he was severely wounded, eventually being healed by Hrafn. Sveinn then left the country and Jórunn's next suitor was a priest called Magnús, who took her away from Ísafjörður to Dýrafjörður. This displeased a man called Bergþórr, who had previously fancied her and came looking for her. Magnús concealed Jórunn elsewhere and sent Bergþórr off with a dog as a parting gift, along with a couple of satirical verses. Bergþórr and Þorvaldr then chase Magnús who hides in a cave. Eventually Magnús and Jórunn make their escape to Norway, with her disguised as a man. In Norway they have many children and presumably live happily ever after. The saga's editor, Guðrún P. Helgadóttir, draws attention to a similar episode on Sturlu saga (in the Sturlunga compilation) in which a widow, Yngvildr, cut her hair and dressed as a man to escape to Norway with her lover. That episode took place in 1158 and may have been a model for this one, though no doubt such things also took place in real life. The Sturlu saga episode also had the complication of a possible love-child, though there is no mention of such a thing in Hrafns saga. For some more stories from the Westfjords, I can recommend Emily Lethbridge's Saga-steads blog. Although the Westfjords (Vestfirðir) of Iceland are sparsely populated nowadays, they do figure quite largely in a variety of Old Icelandic texts. Several sagas are set, wholly or in part, in the region, including some very well-known ones like Gísla saga, which has its own trail mainly around the Dýrafjörður area. Here however I will just look at a few anecdotes from my favourite text Landnámabók which both interested me and are linked to places I visited on my recent tour of the region. 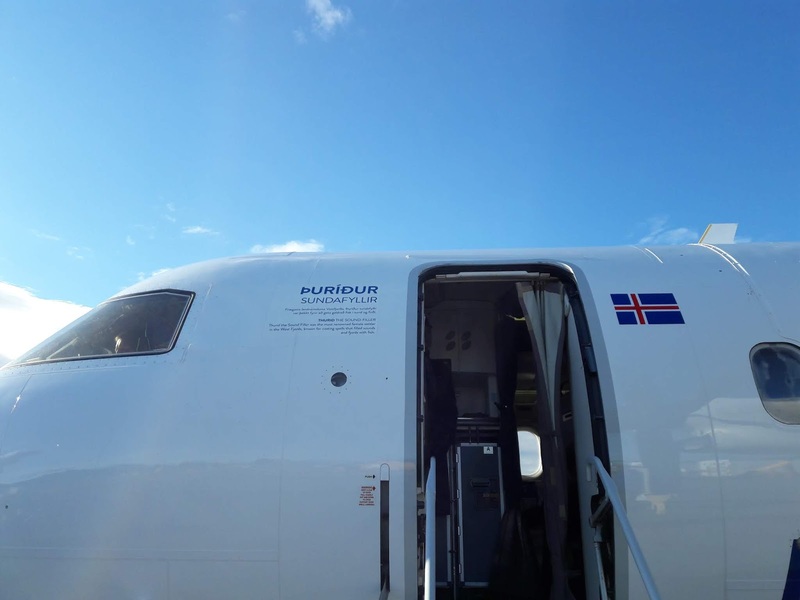 Flying to Ísafjörður, our Air Iceland Connect plane was named after Þuríðr sundafyllir 'sound-filler'. The lady was a settler from Hálogaland, in Norway, where she had the particular talent of filling every sound with fish at a time of famine. She continued her fishing leadership role in Iceland. Having settled Bolungarvík (where we stayed at the splendid Einarshúsið guesthouse), she established a fishing ground at Kvíarmið out in the mouth of the Ísafjörður and took as payment one ewe from each of the farmers in the region. She could be seen as the founder of the fishing industry which is still such an important part of the economy of the Westfjords. The name Ísafjörður nowadays refers to the fjord in which the town of the same name is situated, but then seems to have referred to the whole of what is now known as Ísafjarðardjúp, as discussed by Svavar Sigmundsson. Ísafjörður is particularly associated with the little-known saga of Hávarðr. This saga is several times referred to in Landnámabók which appears to have used an earlier version of it as a source. A memorable experience on our trip was the extremely hairy drive down to Rauðasandur, near Patreksfjörður. The eponymous beach is extremely beautiful and, as the name suggests, the sand is indeed fairly reddish. The explanation seems to be that this colour derives from some scallops with reddish shells which form the sand. However, the sand did not strike me as particularly red on our visit, but I suppose it depends on what you mean by 'red'. This colour term was a bit wider in Old Norse than in modern English, also being applied for instance to gold. Although I don't have a convincing picture to demonstrate, I could just about see the sand as reddish gold (as indeed in the picture here). Landnámabók provides an alternative explanation, namely that the place was named after a certain Ármóðr inn rauði 'the red'. The area is still being farmed and one can see why it would be an attractive proposition for a settler, particularly one who would arrive by boat rather than the vertiginous road over the mountain that we took. Since Landnámabók does not have much to say about Ármóðr, we can perhaps assume that his nickname was derived from the place-name, rather than the other way around, and that the colour and size of the beach were sufficiently distinctive for it to be an important navigational marker. Uncertainty about the origin of the name could explain the alternative forms, Rauðisandur 'Red Sand' and Rauðasandur 'Sand of Red'. My third anecdote relates to what is now called Hrafnseyri, but is in the old texts mostly known as Eyrr or Eyri (along with Flateyri and Þingeyri - spits of land sticking out into the fjord were the ideal settlement sites in this region it seems). As mentioned in my previous blog post, the place was eventually named after Hrafn Sveinbjarnarson, a topic to which I will return in another post. But the first settler there was a certain Ánn rauðfeldr 'red-cloak' who received the land from the eponymous settler of Arnarfjörður, Örn, when the latter moved over to the more clement Eyjafjörður. Ánn had married a certain Grélöðr while harrying in Ireland, and she had thought there were bad smells emanating from the ground at their first residence in Dufansdalur. But when they moved to Eyri, she thought the grass had the fragrance of honey. While we were there, someone was cutting the grass around the church and the whole place was indeed very sweet-smelling!. As regular readers of this blog know, I quite often go to academic conferences in the Viking diaspora and usually manage to stay on for a few days to have a bit of a busman's holiday. This summer's big conference was the 17th International Saga Conference in Iceland, held in Reykjavík and Reykholt. The conference was both enjoyable and useful but rather large (over 400 attended). And Iceland is a pretty popular tourist destination these days. So where to go to get away from it all? A colleague and I decided that a tour to the Westfjords (Vestfirðir) was in order. This region has only about 7000 inhabitants (everyone having moved to the Reykjavík area), but some of the most beautiful and wildest scenery in Iceland. The trip was a great success and if you like you can follow some of our adventures on Twitter. The region resounds with saga-echoes, mainly many sites associated with Gísla saga, but I was also delighted to visit Hrafnseyri, the home of Hrafn Sveinbjarnarson, whose maritime adventures in the Hebrides I once wrote about. But we were mainly there for the scenery and there was certainly plenty of that. I totally fell in love with Arnarfjörður (pictured above), the views of which were some of the most magical I have ever seen. The fjord is named after a certain Örn, a noble man from Rogaland, who first settled there to escape the tyranny of Haraldr Finehair. Clearly, he was not so impressed with the beauties of Arnarfjörður, for Landnámabók relates that he spent the winter at Tjaldanes because there the sun did not disappear entirely on the shortest days of the year. And not long after that he moved to the more forgiving landscape of Eyjafjörður. Still, some people continued to live in Arnarfjörður, and at some point in the fifteenth or sixteenth century they acquired an alabaster sculpture of the Trinity, which is now in the National Museum of Iceland. The caption there states that it was made in Nottingham and found in Arnarfjörður, but not where. The sculpture is mentioned in an article by Philip Nelson in the Archaeological Journal of 1920, but its provenance is not given. There may be more detailed information I can track down in which case I shall report back. Certainly, Nottingham was famous for its alabaster carvings and they were widely dispersed at the time. In the meantime, let's hope that the refurbishment of Nottingham Castle Museum now underway will acknowledge this Icelandic connection, for there are certainly more of these alabasters there than the 'one' that is mentioned in this article in the Nottingham Post last year. Maybe they will even borrow one or two for an exhibition, in which case it will be Nottingham to Arnarfjörður and back. Time flies, and it's been all of three years since I was last in Orkney, so I was very happy to have the opportunity to go again last month. As so often, the excuse was an academic event, the splendid 4th St Magnus Conference, but I always manage to work in some extra time to enjoy my favourite islands. As this was my twelfth visit to Orkney, I have been around quite a lot of it, including most of the inhabited islands. But each time I discover something new, and this time I got quite excited about Hoxa on South Ronaldsay. Something for everyone there, starting with a broch (who doesn't love them? ), a fascinating Norse place-name with associated saga-reference, antiquities from both world wars, and a gallery with some wonderful tapestries. So here's a little bit about all of these marvellous things. There's not much to see of the broch, as it's been mucked about with quite a lot, but its position is amazing, as with so many brochs, and as noted by the RCAHMS 'The broch, Howe of Hoxa, lies in a conspicious and commanding position on a rounded eminence, 50-60ft above the beach, at the N end of a hog-backed ridge on the broad low-lying isthmus which divides the Bay of Widewall on the S frrom the Dam of Hoxa on the N.' In the Viking Age, the broch will have appeared as a mound and this mound has given its name (Old Norse haugr) to the nearby farm, Howe, and to the isthmus on which it is placed, Hoxa. The name of this isthmus is recorded in Orkneyinga saga as 'a Haugahæide' - the form is not very reliable as the only medieval manuscript of the saga at this point is the late, and sometimes confused, Flateyjarbók. Luckily, there is an earlier reference to it from 1329 as 'a Haugs æiðe' and by 1492 it is already being written as 'Hoxa'. The 1329 document is of great interest since it is one of the only four surviving documents written in Old Norse and issued in Kirkwall. It records a sale of lands and has contemporary forms of 10 place-names (including that of the island) 'all of which, with the exception of [one], can still be easily recognised today' (Hugh Marwick, Orkney Farm-Names, 1952, p. 169). The saga-reference to Hoxa is equally interesting, as it claims (Orkneyinga saga, ch. 8) that Thorfinn Skull-Splitter (Þorfinnr hausakljúfr) died of illness and was heygðr 'laid in a haugr' í Rögnvaldsey á Haugaeiði as Finnbogi Guðmundsson's edition of 1965 has it. There are examples of Viking Age burials in brochs, at Gurness for example, so this is not implausible. Or it could just be an example of an aetiological tale, a story explaining the origins of something, derived from an understanding of the place-name. We don't know much about this particular Thorfinn, or why he got his nickname, though the saga does tell us that the daughter of Eirik Bloodaxe and Queen Gunnhild was married to his son Arnfinnr and that Thorfinn got to be Earl of Orkney because his two brothers had died with Eirik Bloodaxe in England. Thorfinn was höfðingi mikill ok herskár 'a great chieftain and warlike' - I suppose they had to add the last bit to counter the fact that he died on his sickbed. His nickname was also borrowed for the strong ale (Alc 8.5% b.v.) produced by the Orkney Brewery. The broch-mound does indeed dominate the isthmus though the latter is very hard to photograph, as you can see from my attempt. And why does English not have a better word than the unpronounceable 'isthmus'? 'Neck' doesn't sound quite right....Also, do ignore the Hermann Pálsson/Paul Edwards Penguin translation of Orkneyinga saga which claims that Thorfinn 'was laid in a burial mound at Hoxa in North Ronaldsay' - they had clearly confused the two present-day Ronaldsays, although the names are clearly distinct in the saga (what is now North Ronaldsay was originally Rínansey and this is the form used in the saga). A. B. Taylor managed to get it right in his 1938 translation. Another interesting place-name nearby, in fact just a bit off to the right of the picture of the isthmus above, is Roeberry, which I argued (Ships and Men in the Late Viking Age 2001, 78) was the Rauðabjörg where a later Earl Thorfinn defeats his kinsman and rival Rögnvaldr Brúsason in a sea-battle. The significance of this part of Orkney for military strategy is underlined by the twentieth-century antiquities out on Hoxa Head, gun batteries from both the First and Second World Wars. The site is quite amazing to walk around, especially for the views on a day as gorgeous when I was there. Last stop before the war relics is the Hoxa Tapestry Gallery. I learned about this through my mother, who is very interested in weaving and textiles generally, so dropped in for a visit. The tapestries are amazing, all of them, and Leila Thomson frequently makes use of both the local landscape and its historical associations. Although the isthmus is difficult to photograph, as I noted above, she can imagine it, and has, in a tapestry called Haugsaith: between two shores which also has some not bad runes on it. There is so much of interest at Hoxa and with the fabulous weather it was certainly a most successful excursion. Just a little footnote to previous posts on this topic... Here in Britain we have suffered some unseasonal weather at a time when we might expect winter to be turning its thoughts to spring. In March there was quite a lot of snow across the country (something generally unusual in lowland England, even in the winter months) causing a period of chaos. Some places even had snow as recently as today. This weather was popularly known as the 'Beast from the East'. Veðr mun þar vaxa, / verða ótt snemma, / hvítabjörn hugðir, / þar mun hregg austan. 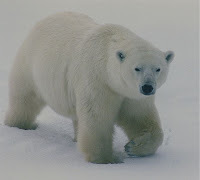 It means that a storm will grow, it will soon be daybreak, if you think of a polar bear, it means a blizzard from the east. Interestingly, this reference to a polar bear is what scholars have used to justify the manuscript title of the poem Atlamál in grœnlenzku 'The Greenlandic Poem about Atli'. There is however little real evidence for a Greenlandic origin for the poem, which the latest editors think is quite likely to be Icelandic and no earlier than the twelfth century. The story is ostensibly set in Denmark, but whether the author was Greenlandic or Icelandic, we don't need, I think, to take either their dream interpretations or their ideas of Danish weather too seriously. And we can enjoy the author's little joke in making Kostbera (the second element of whose name means 'she-bear'), dream of a bear. My North American correspondent has alerted me to a news item in which some 'celebrity' or other refers to her infant daughter as a 'baby Viking' because she celebrated her first birthday by 'feasting on steak'. As it happens, I am not aware that the eating or not eating of steak is one of the aspects of how we define Vikings. Nevertheless, I thought it might be of interest to see what some Old Norse texts see as the defining features of baby Vikings. 'Still I have come to the hearth of Yngvar, he who gives to warriors gold (the bed of the gleaming thong of the heather). I was anxious to find him. You will not, giver of the twisted, shining gold (land of the snake) find a better three-year-old craftsman of poetry than I am. [Thong of the heather is a snake, and the snake's bed, according to tradition, is gold]. (Egils saga, tr. Christine Fell, 1975, p. 182). Anyway, six is a bit beyond babyhood and nearing the age of reason. This little tour of baby Vikings does not suggest that steak played any part in their achieving that status, but then it is not recorded what they ate and only hinted at what they drank. 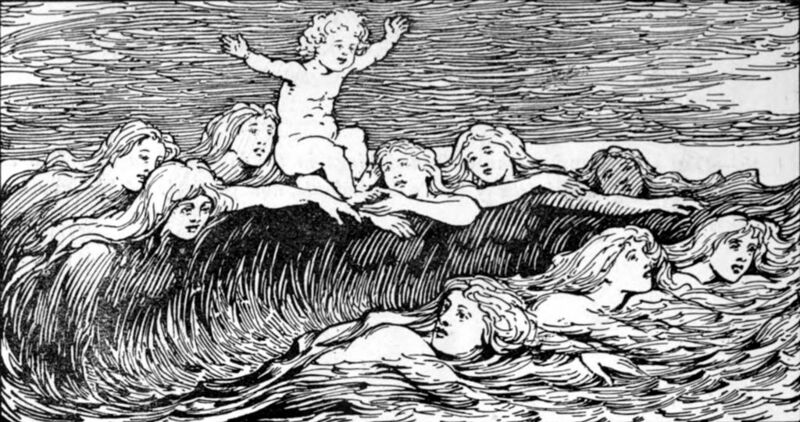 From the legendary poetry of the Edda to Snorri's prose mythology and the historical fiction of the saga, we do find an admiration for exceptional individuals, expressed in their baby Vikinghood. But I do not expect any time soon to read articles claiming that the Vikings started training their warriors at one day old. At least I hope not. Welcome to my blog. During the day (and sometimes the night) I teach and do research into Old Norse language and literature and the Viking Age. The purpose of this blog is to record experiences and observations from my encounters with Vikings in the media, in popular culture, and on my travels in the Viking world. I record these for myself, but it might be that you, too, dear reader, are interested. If so, please feel free to comment. The Shetland Boat: History; Folklore & Construction. | Progress in the academic research of the Shetland boat. The burnt timbers of the hall appears.